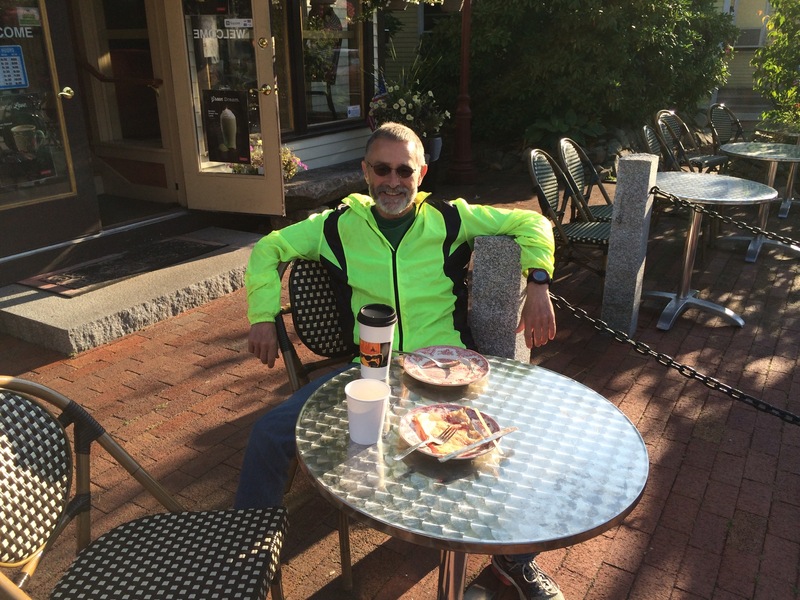 Kennebunkport, ME, Friday August &, 2014 — Reintegration back into non-hiking society began in earnest this morning with a visit to a local coffee shop called Morning in Paris. Can’t get much further from the back woods than that. Later we jumped on my friend Ed’s Vespas and scooted to the beach to watch some friends surf. 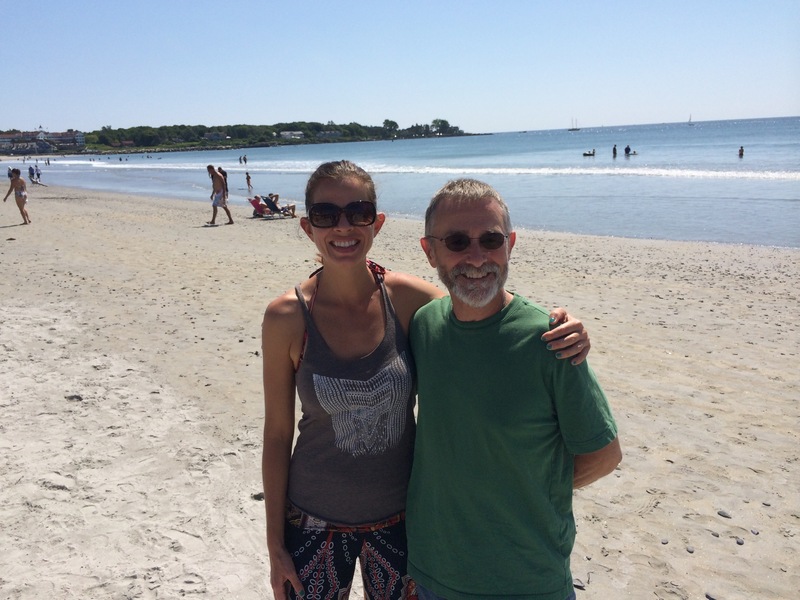 His daughter Katie is home from her job with the United Nations, so naturally we posed for our “life is a beach” pic. The adrenaline drained from my system during the shuttle from Millinocket yesterday. I was too exhausted to join a party in progress at a local Irish pub. Instead, I sat on the front deck sipping wine and let the sound of the crashing waves massage my cares away. I can tell that I’m still suffering from adrenaline withdrawal because I’m dragging a bit. It feels a lot like the aftermath of a long business trip. I can’t get too far in front of my ski tips. I have two short sections of trail I skipped over, about 27 hours total hiking time. I’ll get the first six hours on Sunday and the remainder Monday and Tuesday. Tuesday or Wednesday I hope to meet with some Appalachian Mountain Club officials to offer them some requested feedback centered on their brand image with thru hikers. These are the Appalachian Money Club folks. Then it’s off to my cousin’s to retrieve the gear I Ieft there. After that it’s home to join my trail crew working next Saturday in Shenandoah National Park. Thanks to everyone for your kind kudos since Katahdin, especially HOBO whose congratulatory text reached me on Katahdin’s summit. His timing was perfect. Note the genuine Paris bistro chairs. After you hike the AT, life truly is a beach!!! Congratulation, Jim. You are enjoying a well-deserved break. Looking good and fit. I need to remember that I’m not burning 4 – 6 thousand calories per day anymore! Jim, thanks so much for sharing your blog and letting me vicariously trav along with you. Can’t wait for the book and movie! Major congratulations for such a huge Accomplishment. Jane, Thanks for your kindness. I’m just hoping I can live up to expectations.